What is a gardening business and who is suited to? What should you include in a gardening business plan? Are there any rules and regulations to setting up a gardening business? How much does it cost to set up a gardening business? How much can you earn running your own gardening business? Whether you yearn for the scent of freshly cut grass, dream of cultivating picture-perfect flowerbeds, or simply desire a more varied working life in the great outdoors, a garden maintenance business could be the start-up option for you. 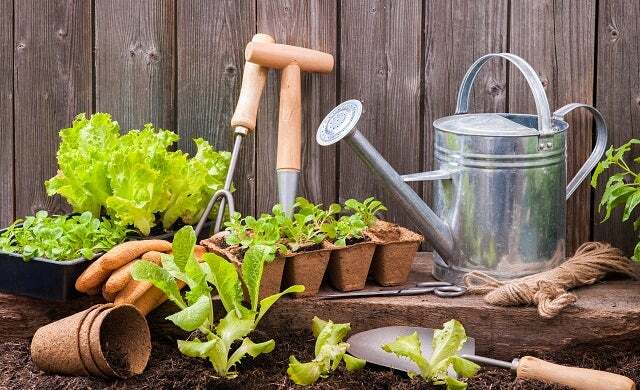 But green-fingers alone is no guarantee of setting up a successful gardening company, you’ll still need a good head for business, the inclination to labour for long, hard hours and the grit and determination to secure your own work. A gardening business is a year round profession – as well as soaking up the rays during the short-lived and temperamental British summer you’ll also have to endure the frigid days of winter and those famous April showers, as illustrated by Colin Campbell Preston, manager of Capital Gardens. If you want to become a gardener it “helps if you like the outdoors and are fairly hardy”, he says: “most gardening businesses involve doing work for private households, then progressing to commercial work then council work”. Because of this, “the number of businesses in the first two categories far outstrip the last category”. Garden maintenance is the “easiest way” to start a gardening business, Preston explains, but it can be “difficult to grow such a business and many people find it repetitive”. However, there are many positives: a gardening business “allows for creativity and, if it works well, a lot of job satisfaction”. Rune Sonvdahl, CEO of Fantastic Gardeners, echoes Preston’s comments: “The gardening business offers services for garden maintenance. It is suited to anyone […] who likes working outdoors, doesn’t mind the weather, loves gardening and is fit (in a healthy condition) for the job”. Sonvdahl says that at the very least you should “learn the basic skills and beyond – for example: structure, design, and most importantly, the engineering of different landscapes”. Being very reliable, turning up when you say you will, leaving things tidy when you leave etc. will help you stand out from the competition. So you think you’re the right sort of person to start a gardening business – you’ve got the knowledge, you’ve got the skills and you’ve got a positive all-weather attitude to working outdoors. But, before you dust off the lawnmower and pull the ripcord it’s time to put some thought and effort into the bedrock of your business – the business plan. While you’re probably going to be offering your gardening maintenance business in your local area, it’s unlikely you’ll be the only person providing such services. Do some research into your competitors and their customer base. Unless they’re doing a terrible job, you’ll find it difficult to start poaching custom. Both residential and business gardening “have very lucrative sides to them”, Sonvdahl explains, “the residential gardening opportunities let you meet different people every day, build up your client base, etc. while when it comes to businesses, you sign a contract and you have secured work even in the low season or bad weather”. While business work can be far more regular, it can be difficult for brand new start-ups to secure corporate work. Doing residential work is a good way to not only build your reputation, but to learn your craft in a smaller and more manageable environment. Next, but also very important is “the budget for tools, materials, marketing, a gardening van and their branding”. Sonvdahl says you should “always have high quality equipment to avoid extra cost” of anything breaking or becoming faulty. There is more than one type of gardening service you can provide so you will also want to include what type you will specialise in: “maintenance, landscaping, tree surgery”. However, this may be dependent on the geography of the area you’ve chosen: “e.g. the garden types differ in the outskirts vs. Central London”. A more complete list of gardening services could include mowing, weeding, planting, strimming, pruning, general tidying, hedge trimming, application of feeds and pesticides and removal of garden waste. However, you could even extend your offering to include complete garden renovation, consulting services, shed and fencing repairs. Finally, Sonvdahl says you need to research and understand the demographics of the households or clients you’ll be servicing in order to “prepare the pricing”. If you’re going to be maintaining the gardens in an affluent area you can charge more for your services – though you may be expected to provide a higher standard of service. Whatever kind of work you decide to offer, providing a reliable and consistent service and maintaining good relationships with your clients will put you in good stead for a long and fruitful career in the gardening business. Once you’ve worked out “the resources and tools” you’ll need, as well as whether you’re going to be “a grower, landscaper or designer”, the most important thing you have to work out is “how you are going to find clients”, says Preston. As you are offering a localised service, you can target your marketing in a very traditional sense by advertising in other local businesses or posting through letterboxes door to door – never underestimate the power of word of mouth. However, don’t fail to make the most of the host of advantages the digital age provides – a Facebook page, LinkedIn profile and Twitter will help you reach a much bigger client base. Additionally, apps such as Startups 100 featured BIZZBY are revolutionising the way customers connect with tradespeople. By signing up to the service, you become available to a new network of customers looking for on-demand services. Considering the potential for hazards, there’s actually very little regulation that gardening businesses need to be aware of. Because of this, the industry is ripe for exploitation by ‘cowboy’ gardeners, who, with limited equipment and training, can go round the houses offering shoddy work for low prices. But not to worry, most homeowners can spot the difference between a professional and a cut-price gardener. Knowledge and hard work will always win out over the promise of a quick, cheap job. According to Preston, the only legislation you need to abide by to set up a gardening business is getting insurance and “proper training” as “you cannot use chemicals on someone else’s land” without it. He suggests completing a course from the Plant School, which offers students courses in plant and tree knowledge, running one day a month through the academic year. You don’t have to have a qualification, but the obvious advantage of having one is that you will be taken more seriously by potential clients and can charge a higher price for your service. Don’t be afraid to ask for what you think is a fair price for your trade. With all the equipment, a gardening business does carry inherent risks and responsibilities increase the more employees you have. “You have to have an understanding of health and safety to be safe and insure the safety of others”, advises Sonvdahl – “also, you need to have permission from the council to perform a particular service”. Public liability insurance isn’t essential but will protect you from any sudden claims that could cost you. You could easily damage property or leave something behind that could injure a member of the public. “Avoid doing things you are not certified” to do, adds Sonvdahl: “for example: electricity in a pond or structure they are going to build on top of”. As a general rule of thumb, the best way to avoid future problems is to “always make sure that the job you are about to perform does not require a certificate or a permit that you don’t have and get damage insurance”. He also recommends always wearing safety gear: “gloves (otherwise your hands can get damaged by poisonous plant fluids, or hurt by improper use of the tools) and protective glasses (so nothing like dust or other particles get in your eyes)”. Finally, Sonvdahl suggests you “avoid mowing the grass when wet, as this damages the lawn mower […] and avoid spraying with weed killers during daytime due to bees and other bugs and insects”. It’s best to spray late in the evening or early in the morning. Firstly, you need to think about the gardening equipment you need. In terms of tools, Preston says that bare essentials such as a “spade, fork and maybe even a lawnmower will be needed for even the most basic jobs” but “more specialised tools can be bought as and when you need them depending on the client or work needed. It really does depend on the type of business”. You should also definitely include protective equipment in your initial start-up costs – mowers and leaf blowers can be noisy and sustained exposure to such high decibels has the potential to cause lasting damage to hearing and chemicals or vegetation can cause damage to skin and eyes. A decent pair of gloves, goggles and ear protectors should keep you safe. Your clothes are likely to get ruined by constant work outdoors, so it’s worth investing in some hardwearing work clothes. Occasionally, residential and business clients will have their own equipment they will allow you to use. But you limit yourself by not having your own and you have to make sure you are insured to use theirs. Of course you’ll also need something to transport all this equipment around in. Preston says “it depends on equipment” but “the most expensive thing to do a job properly is to acquire a vehicle”. He suggests that “a cheap and reliable gardening van is all you need at the beginning”. Sonvdahl advocates the best van for gardening to start with it “a short wheel base gardening van (Ford Transit) so you have enough space to carry all tools and take away all debris from the job. If you are successful, get a bigger vehicle. Tapper is the ultimate choice when your business starts to really flourish. Use diesel for better cost-efficiency and a vehicle not older than 2010”. You could consider buying a second hand van without any graphics to start with. Once you’ve got the initial equipment costs out of the way, setting up a gardening business can be a relatively low cost start-up option. Costs will generally depend on “what your ambitions are, as well as how many people you have on the team”, Sonvdahl thinks “a gardening business that is aiming to be successful needs between £7,000 and £10,000 which includes costs for purchasing and branding the vans, buying proper equipment and tools and insurance”. He also advises making sure you have “three months of budget in case things don’t pick up quite in the beginning”. You could also look at the idea of buying into a gardening franchise to set up your gardening business (see more in our franchise directory). Think also about where you’re going to store all your equipment and vehicles. At the start, a decent and secure shed at your home should be sufficient, but as your business grows – if you don’t have the space at home – you may want to think about renting something a little more substantial. Other costs will include marketing for your gardening business. A Startups member says “As for advertising, someone we know who set themselves up as a gardener leaflet dropped, put flyers in the local shops and the post office. It proved very successful and local people wanted a local person to sort out their gardens. These days he advertises in the local ‘free’ directories/magazines.” Another member agrees: “My husband has never spent much on advertising – he started by putting cards in newsagent’s windows and has got all his work after that via word of mouth.” You may want to consider getting a business mobile to separate your enquiries from personal calls (more information on our page on business mobile phone contracts . Really it’s up to you how much you earn as a gardener. Provided you make informed decisions about where and how you want to work and are prepared to get out into the world and win customers, a gardening business can blossom into a very lucrative trade. As with any business, do not expect that you will make a lot of money to start with; just take it steady and add just that little extra to your service. There are a number of ways to charge clients for your work, and the option you go for depends on a number of factors. You may want to charge by the hour or a fixed price. Clients may be more comfortable paying a fixed price. If you’re going to be providing regular work, week after week and providing exactly the same service, then arranging a set price is easier for both parties. Alternatively, you could offer a fixed price for different services as some are more demanding, require more skill or equipment, or take longer than others. “From about £15,000”, suggest Sonvdahl, “however, there is no limit to what you can earn. It depends on the number of projects you take care of and the size of your team […] the quality of your work and your dedication”. With so many variables it’s impossible to say exactly, but Sonvdahl ventures an average of “between £35,000 and £70,000 per year”, not forgetting that “side jobs get you more cash and bonuses for a job well done”. Another “good thing about gardening is that a happy customer will always call and book you over and over again” he adds, “even getting asked to help with some renovation jobs in their home is common”. However much you charge and whatever services you decide to provide, as with any business, a sure-fire way to maximise your income is to provide a consistent and high quality standard of work, maintain good relationships with your clients and always be on the hunt for new opportunities.